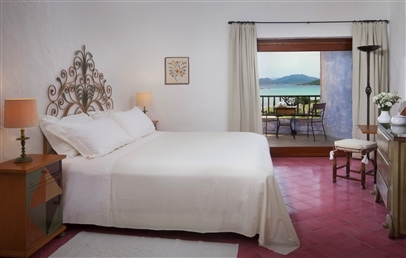 The Cala di Volpe is located in Porto Cervo, the tourist centre par excellence in Sardinia, favoured destination for the national and international jet set, place of meetings and social life, of unbridled luxury and high class fun. Pampered by the attentive staff, always ready to satisfy all your needs, you will live your holiday among sea, sun, shopping and going out in the best restaurants and nightclubs of the Coast. It’s the right choice for those who love seeing and being seen. Located in Porto Cervo, in the beating heart of the famous Costa Smeralda, the symbol of luxury tourism in Sardinia, the Hotel Cala di Volpe stands in perfect harmony with the surrounding environment. Built in perfect Mediterranean style, the Hotel Cala di Volpe is designed to be like an ancient fishing village, in a network of towers, porches and terraces that are covered and almost merge with the typical Mediterranean scrub, in a delightful combination of colours between the green nature and the crystal blue sea. 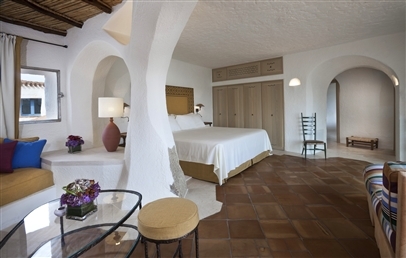 All 121 rooms and Suites are furnished with typical materials and fabrics, ceramics, stones, furniture strictly hand-carved by local artisans; from the beautiful terraces the guests can enjoy the breathtaking view over the sea or the wild Mediterranean scrub. Guests can have lunch at the Barbecue Restaurant (seasonal), at dinner the Cala di Volpe Restaurant offers a wide range of delicacies from international and national tradition with the taste of the finest wines. For those who prefer something lighter and less demanding, you may go to La Piazzetta Bar, which offers dishes from local tradition with a refreshing drink in a informal atmosphere, at any time of the day. Breakfast and lunch have a buffet and dinner is served à la carte. Guests can take part in the Lunch and Dine Around Program. Various recreational activities are available for guests of Cala di Volpe Hotel. For a relaxing afternoon, let yourself surprise by the magnificent Olympic size salty water swimming pool, one of the largest in Europe, sipping a cocktail at Bar La Piazzetta. The most sporty can rely on three tennis courts, on the Pevero Golf Club; on water sports ranging from kayaking to sailing to water skiing, and on a well and modern equipped fitness centre, free and available 24/7. For any particular requirement, guests will find our team of Concierge Luxury Collection: country and qualified expert staff, ready to satisfy the guests needs, from the booking of Limousines, to the Golf or just for suggestions about restaurants or places to visit. Personalized service executed with elegance and dedication. 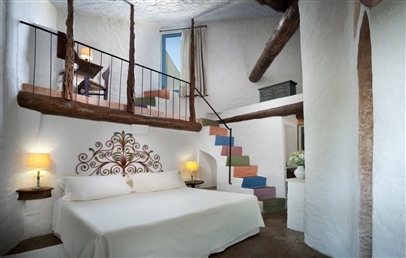 Comfortable double rooms, elegantly furnished in Sardinian style and different from each other in the details and color nuances. They are characterized by white walls, local fabrics and materials, ceramics, stones and furniture carefully hand-carved by local craftsmen. 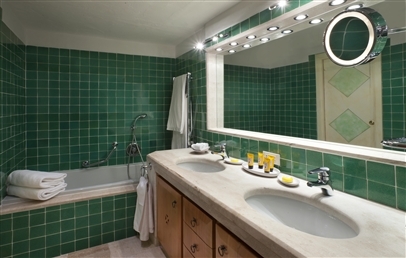 The bathroom, with both shower and tub, is in Orosei marble and provided with makeup and shaving mirror, hair dryer, bathrobes, slippers and courtesy set. 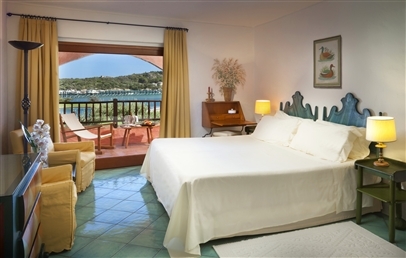 Superior rooms have a balcony with view over the bay. 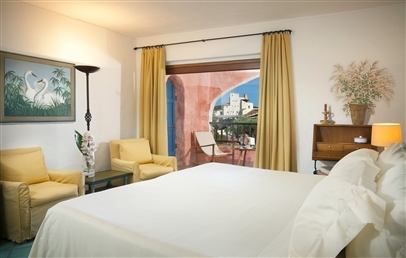 Spacious double rooms, elegantly furnished in Sardinian style and different from each other in the details and nuances of color. 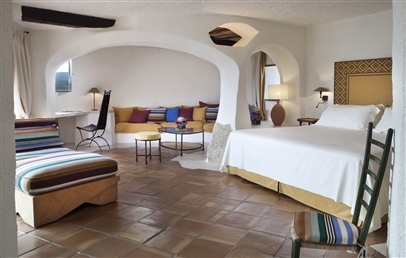 They are characterized by white walls, local fabrics and materials, ceramics, stones and furniture carefully hand-carved by local craftsmen. The bathroom, with shower and tub, is in Orosei marble and provided with makeup and shaving mirror, hair dryer, bathrobes, slippers and courtesy set. Premium rooms have a balcony with sea view. 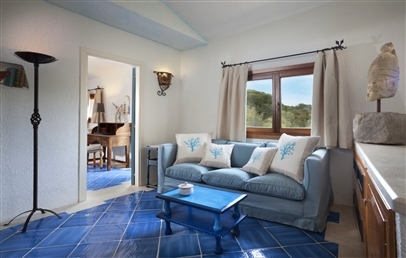 Bright suite, elegantly furnished in Sardinian style and different from one another in the details and nuances of color. 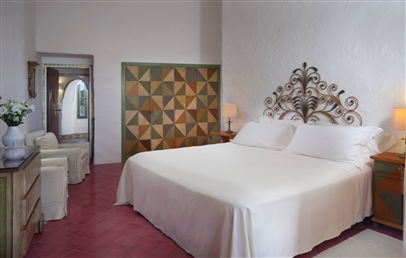 They are characterized by large ceramic tiles cooked homemade, white walls, pastel colors fabrics and carefully hand-carved furniture. They consist of double bedroom, with king-size bed with wrought iron headboard, and a large living room with a sofa, two armchairs, coffee table and embellished with two large windows. 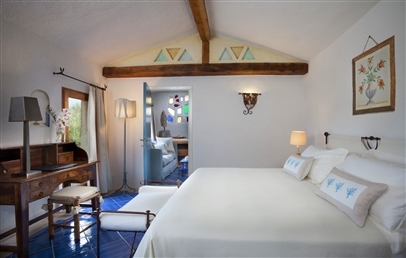 The wide bathroom is decorated with a game of mosaics on the walls and the floor and is equipped with hair dryers, bathrobes, slippers and complimentary toiletries. The shower and bathtub are separated and covered in marble of Orosei. 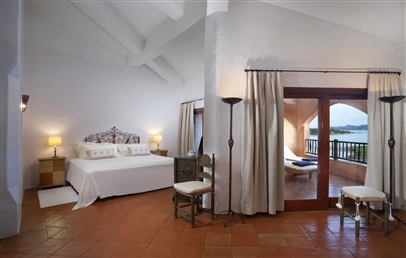 The Deluxe Suites overlook spacious terraces with sea views, furnished with a chaise longue, handmade stools and wooden teak table plus cushions. 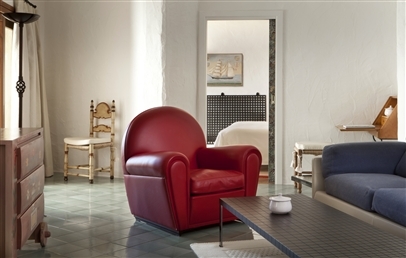 Bright suite, elegantly furnished in Sardinian style and very different from one another in details and nuances of color. They are characterized by large ceramic homemade cooked tiles, white walls, pastel colors fabrics and carefully hand-carved furniture. They have a double bedroom, with a wrought iron headboard king-size bed, and a large living room with a sofa, two armchairs, coffee table and embellished with two large arched windows. 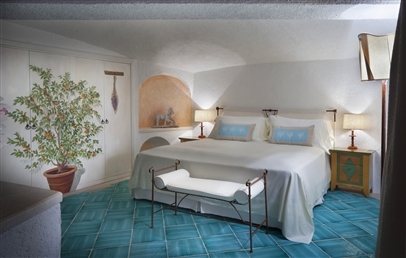 The bathroom is wide and decorated with a game of mosaics on the walls and the floor and it is equipped with hair dryers, bathrobes, slippers and complimentary toiletries. The shower and bathtub are separated and covered in marble of Orosei. The Premium Suites overlook spacious terraces with sea views, furnished with a chaise longue, handmade stools and wooden teak table plus cushions.